After six months on the market, the Prius Plug-in model has sold over 6,000 units. This sales figure represents sales momentum that has propelled the Prius Plug-in to a stronger first full six-months sales pace (6,061 units) than Chevrolet Volt Plug-in (2,745 units) and the all-electric Nissan Leaf (3,875 units). The Prius Plug-in model combines the benefits of the standard 50 mpg-rated Prius Liftback with extended electric vehicle (EV) driving and more affordable pricing than pure electric or range-extender type vehicles. 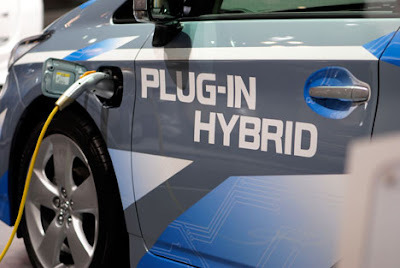 The 2012 Prius Plug-in Hybrid, which offers seating for five, is EPA-rated at 95 MPGe (miles per gallon equivalent) in EV Mode and 50 MPG estimate in hybrid mode. A newly developed 4.4 kWh lithium-ion (Li-ion) battery pack replaces the standard Prius model’s nickel metal hydride (NiMH) battery and fits under the rear cargo floor, and the vehicle adds an easy-to-use external charging cable. A full charge using an external AC outlet takes approximately 2.5 to 3.0 hours using a 120v household outlet or 1.5 hours using a 240v charging station. Buyer data shows that some consumers purchase a Prius Plug-in instead of a Chevy Volt or Nissan Leaf because of its fuel economy, how the Plug-in dispels range anxiety of pure electrics, and the value that the Prius Plug-in represents. Customers are especially keen on the Plug-in’s EV driving capability and high MPG hybrid mode alternative. The Prius Plug-in’s EV Mode range of up to 11 miles (EPA-rating) helps reduce trips to the gas pump by charging at home or the office. The Prius Plug-in qualifies for a Federal Tax Credit of up to $2,500 in addition to the State of California’s Clean Vehicle Rebate Program (CVRP) which offers a $1500 rebate.